These are the items one can buy online in order to build a computer, or potentially upgrade in a manufacturer-built system. Although the different components of basic computers are becoming less and less relevant as integrated chips become more powerful, there remains a set of items that every desktop computer needs in some form or another. An AMD FX-8350 CPU lying next to its AM3+ socket, the pins clearly visible. The term "processor" has meant a number of things over the years, but generally refers to the CPU, or central processing unit. This part of the machine performs all of the calculations the computer undertakes, and could be compared to the brain of a human. One of the most prominent parts of a CPU is the ALU, or arithmetic logic unit. This is the heart of the processor, and actually performs mathematical calculation. The other of the two primary components is the CU, or control unit, which extracts the instructions for the ALU from memory and decodes them. The CU relies heavily on the ALU. A basic diagram of a CPU's internal components. Cache – often labelled as L1, L2 or L3 cache – is where instructions and information loaded from the RAM are held. In typical computer usage, L1 cache (the fastest and smallest capacity) may be entirely rewritten several times in a second. Frequently visited areas (addresses) of the RAM are likely to be loaded into CPU cache and remain there for some time. The purpose of cache is to help provide instructions to the ALU at a faster rate, so that it does not become idle for short periods of time as the CU decodes instructions. Cache achieves this by having incredibly high read and write speeds. Although not physical, the instruction set is also integral in a CPU. The instruction set is a list of basic commands that the CPU is able to understand, which are often referred to with single letters. All software that is executed can only be run after being converted to just these commands. The process of converting human-readable source code to these instructions (called machine code) is called building, and is required for languages such as C and C++. An example of an instruction set is x86-64, also known as x64 and AMD64, which is used in the vast majority of microprocessors today. 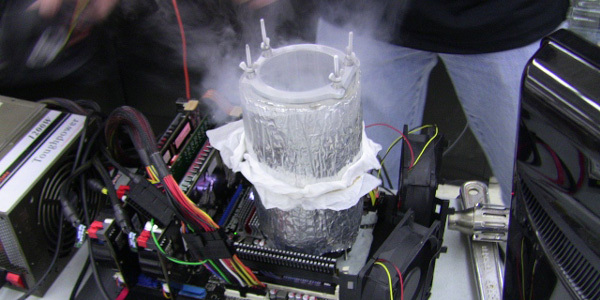 The process of extreme overclocking to set world records often involves the use of liquid nitrogen, poured down a funnel directly onto the CPU. Performance of a CPU is dictated by a number of factors; namely clock speed, core count and thread count. Clock speed, measured in megahertz or gigahertz (MHz or GHz), is the rate at which electricity passes through the CPU's circuitry. A higher clock speed allows for more calculations to be executed per second, and modern microprocessors are often clocked at above three-billion cycles per second. A CPU with multiple cores essentially has multiple ALUs, often sharing cache. These CPUs are referred to as multi-core, and are particularly proficient at multitasking. The more cores, the more processing power that can be accessed by the operating system, granted software is built to work with it. Typically each core has a single hardware thread running from it to the CPU socket, but some modern CPUs have two per core (which Intel calls hyperthreading). This allows for the cores to be used to their full potential, without the threads becoming a bottleneck. This is efficient as performance is improved and power consumption barely changed. The term memory often refers to random-access memory (RAM), despite the existence of ROM (read-only), NVRAM and mechanical storage. Memory is in fact any kind of data storage made available to a computer system. RAM is perhaps the most frequently used, asides from hard-disc and solid state drives, however. 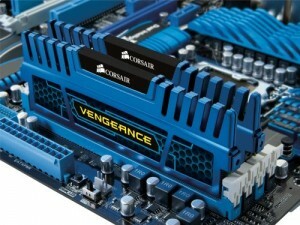 An 8GB Corsair Vengeance RAM kit, made up of two 4GB DIMM modules. RAM is most commonly used in the form of DIMM (dual in-line memory module) sticks, each housing a number of integrated memory circuits. Many laptops, mini-PCs and network routers use different form-factor modules, called SO-DIMMs (small outline DIMM). These are smaller, and have fewer data pins on them. Sticks of RAM have become cheaper and cheaper to buy over the years, and their installation is one of the simplest modifications one can make to a computer. RAM is also categorised by data rate. The first RAM modules were single data rate, meaning data could be retrieved or written to RAM once per clock cycle. With the advent of DDR (double data rate) RAM modules, data could be transferred on the rise and fall of voltage in the chip, allowing for double the performance. DDR then progressed to DDR2, in which two juxtapositioned signals are sent per cycle, allowing for four times the performance. Once more this moved to DD3, allowing for eight times the performance, and DDR4 DIMM modules are beginning to appear on sale now. RAM installed on the motherboard. RAM is often referred to as volatile storage. This means that without power – e.g., when the computer is not switched on – the sticks cannot hold information. RAM sticks are mounted in DIMM slots usually to the right side of the CPU socket on a standard ATX motherboard. RAM is used constantly as the computer is running. It stores two types of information – instructions and data – and can be read from very quickly by the computer. The instructions on the RAM consist of machine code for execution by the CPU, and the data is other information such as plain text and other binary files. In order to keep data held on a computer even when power is not available (as is not possible with RAM), storage drives are used. Traditionally these have been hard-disc drives with a series of magnetic platters that are written to and read from by an electromagnetic head on a metal arm but in recent years solid state drives have become a lot more common. These use a form of flash storage which can be accessed at far greater speeds and while consuming less energy. A Western Digital hard-disc drive. Hard-disc drives are cheaper at the moment, considering their volume, and are still used extensively when a high storage capacity is essential. Despite this and the fact that the technology has had far longer to be developed, HDDs are prone to data loss when physically shocked and do not offer high-speed data rates. Using the latest SATA 3 6 Gb/s data cables and SSDs yields a much quicker data rate, making SSDs suitable in a desktop computer for storing the operating system and most frequently used programs. 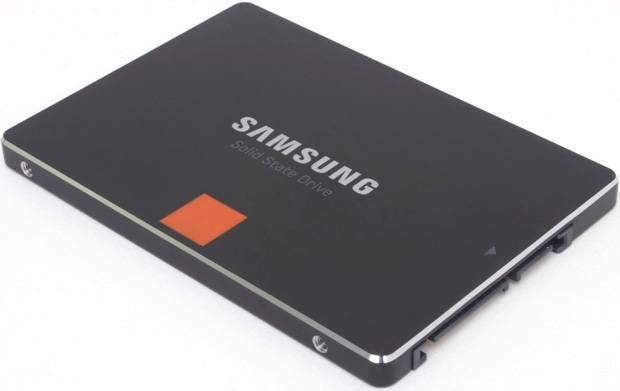 A Samsung solid state drive. Older storage devices, including HDDs as well as optical disc drives and floppy disc drives, used a data transfer interface called Parallel Advanced Technology attachment (PATA or Parallel ATA), renamed from IDE. This was succeeded by Serial ATA, or SATA, in 2003, which offers greater speeds and a much improved cable design. The infamous ribbon cables that PATA used were difficult to manage and obstructed air-flow. There have been two revisions of SATA, each doubling the data rate – from 1.5 Gb/s to 3 Gb/s to 6 Gb/s. Some motherboards still ship with IDE headers, but they are rarely used. Three Kingston DataTraveller Mini USB storage devices, often called memory sticks. The storage devices mentioned above are used for fixed storage systems. They are usually installed in a machine and have an operating system installed on them. In addition to these storage devices, one can use removable solutions. Often using USB connectors, flash memory sticks and external hard-drives allow filesystems to easily be moved form one computer to another. For instance, many students save work and programs to a removable flash drive, and then use this at school or college as their primary saving location. The storage device can be connected to any computer that the student uses, and gives them easy access to their files. Despite the convenience of removable storage devices, they have their disadvantages. For example, USB connectors are not as high-speed as SATA connectors typically used for hard-drives, meaning files can only be read and written at a slow rate. This is a particular issue when handling large files. Most motherboards are now capable of running simple graphics because of the chipset built into them, and are able to manage a standard desktop. Dedicated graphics, in the form of a graphics/video card, become necessary when gaming, 3D multimedia and the use of several monitors comes into play. A dedicated XFX Radeon R9 280X graphics card. Video cards are comprised of a number of components, and in some ways aren't unlike another, smaller computer. The central piece of any dedicated graphics solution is the GPU, or graphical processing unit. Like a CPU, this chip is designed to perform calculations at the fastest possible rate, but is targeted towards different types of calculation. Also, unlike a CPU, there are hundreds, even thousands, of cores inside a typical GPU chip, allowing the device to operate thousands of threads simultaneously. There are also units used solely for texture processing and shading, giving GPUs a huge advantage rendering games and 3D models. Graphics cards also contain their own RAM, called VRAM, which is often faster than DDR3 or DDR4 system memory. GDDR5, for instance, is designed to work as graphical memory and operates at four times the data rate of DDR3. VRAM also often uses a wider bus, allowing more data to be transferred between the memory modules and the GPU, than between system memory and the CPU. Graphics cards, much like dedicated networking and sound cards, connect to the motherboard via a PCI or PCI Express slot. The PCI express bus connects to the northbridge of the CPU chipset, meaning it's capable of much faster performance compared with a standard, outdated PCI or PCI-X bus. High-performance graphics cards also usually have a dedicated cooling solution as the GPU generates a lot of heat, much like a CPU. A Ducky Shine II tenkeyless mechanical keyboard. Many different input devices can be used with all sorts of computers, and they are often referred to as HIDs, or human interface devices. The most common examples include mice, keyboards, touchpads, touchscreens, microphones, webcams and motion sensors. Input devices enable the computer to take commands from the user, before processing them and sending them to various output devices. Input devices can also be used to create multimedia for recording or broadcast. For example, an internet livestream of a game usually includes audio from the player's microphone, and webcams can be used for online video calling. Input devices use a wide variety of physical connectors. Audio, for example, from a microphone typically uses a 3.5 mm jack or a USB connector. Scanners, graphics tablets, mice and keyboards may also use USB. Older keyboards and mice typically use the PS/2 connector, which is still favoured by some keyboard enthusiasts and in particular situations where security is essential. For this reason PS/2 ports are usually still present on most motherboards, either combined into a single port or as green (mouse) and purple (keyboard) ports. 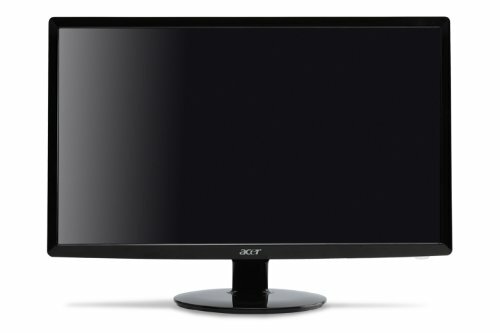 An Acer H220HQL LED monitor, which accepts DVI and VGA connections. At the lowest level, computers are machines for taking and input and creating an output. This is why devices are needed to display the data that the computer has generated by processing input. Output devices, like input devices, are classed as HIDs, or human interface devices. The most common output devices include the screen, which almost all computer systems have, and speakers. Mobile devices can also often vibrate and provide light to see with by use of output devices. Printers and CNC/CAM machines can also be considered output devices, although they can also be considered computer systems in their own right. Monitors can connect to computers via a number of different connections. VGA, introduced alongside PS/2 connectors, is an analogue form of video transfer cable. Despite their disadvantages, VGA cables still see a lot of use today. DVI was the first major digital connector to be released, and uses a design somewhat similar to VGA. HDMI can be used for computer monitors, but is more suited to connecting set top boxes and game consoles to televisions, primarily because sound is also carried by an HDMI cable. The most modern cable design used for connecting computers to monitors is DisplayPort, which can also be used to transfer USB and audio data. Printers and the like commonly connect to computers via a USB cable, and connect to mains electricity for power. A diagram of a simple coaxial cable, showing the different layers of material. Image from commons.wikimedia.org. By Tkgd2007, CC BY 3.0. There are a number of different ways in which cabling can be constructed, and different methods often owe themselves to particular uses. One common cabling method used frequently in telecommunications and data transmission over long distances is coaxial cabling, or coax. A coaxial cable has several layers, each serving a different purpose. At the core is the data line, which carries the data to be transmitted. This is usually a thin copper wire, or sometimes optical fibres. Wrapping around this is a dielectric insulator, protecting the cable from other conductive objects which would short the circuit. Around this is an insulating metallic layer, protecting the data running through the cable from electromagnetic interference. This is often a thin braided copper or aluminium foil covering. Outside these three layers is the final protective shield, holding the other layers together, protecting the cable, and giving the whole assembly more structural integrity. Undersea cables making connections between continents tend to have more layers, providing more reliability and physical strength. 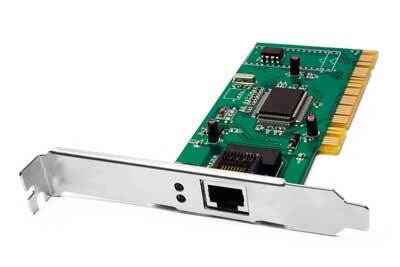 An network expansion card for adding Ethernet capability to a computer without it. The internet is an incredibly powerful resource and in the modern day almost no computer system is functional without an internet connection. In previous years, an expansion card would have been necessary in order to use an Ethernet cable for networking. In recent years, much like with computer audio, networking cards have become almost obsolete, as motherboards are capable enough out-of-the-box. On a desktop PC, an Ethernet cable is generally the best way to get internet access. Ethernet is based on the Category 5 cable, and is used to connect a computer to a router or modem. Some people who wish to use Wi-Fi on a desktop PC use wireless network cards. These also reside in a PCIe expansion slot, and are connected to an aerial via three separate connectors. The allow the computer to connect to wireless networks much like a laptop, tablet or smartphone, but don't offer the same connection speed that can be achieved with an Ethernet cable. A dedicated Sound Blaster audio peripheral card. Every system requires hardware to process sound in order to use speakers or headphones with the computer. Like with networking, sound cards are rare now that motherboards are able to handle basic sound management using the hardware in the chipset. That said, many enthusiasts do not feel that this on-board sound processing is high enough quality, and instead buy dedicated sound cards for their systems. Sound cards are typically used in computers that are built for audio production or broadcasting. Standard stereo output uses a green-rimmed 3.5 mm jack, and can provide power to headphones, for example. It can also be fed into another amplifier, such as in a surround-sound system. Microphone input from a desk microphone or headset uses another identical connector, except that the rim around the socket is pink. Many desktop motherboards also offer a line-in socket, with a blue rim, which acts similarly to the microphone connector. Dedicated cards tend to use multiple connectors to deliver several audio channels to a surround-sound system, in quadraphonic, 5.1 or 7.1 configurations. 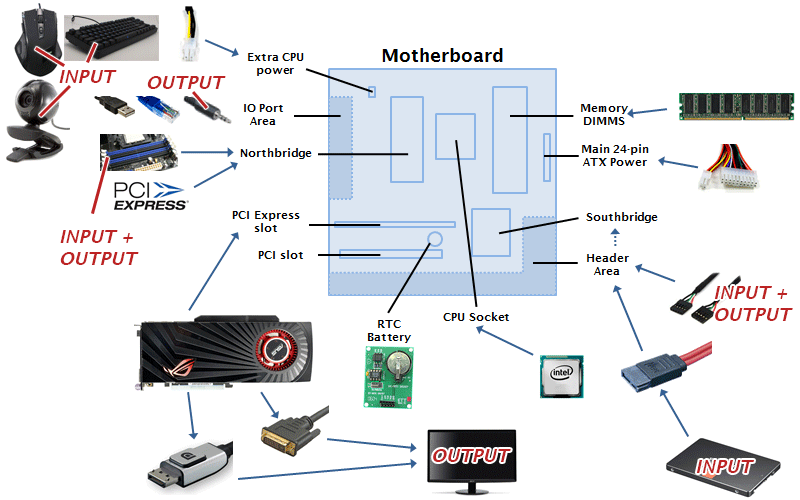 A diagram of a typical ATX motherboard layout. Placement of particular components does vary. A Gigabyte GA-78LMT-USB3 micro-ATX motherboard. The motherboard of a computer holds the CPU and RAM, connects to the storage devices made available to the system, provides mounting slots for peripheral expansion cards, and provides input/output ports usually facing out the back of the computer. The CPU socket is found roughly above the centre of a typical workstation or desktop motherboard. This is where the CPU is mounted, connecting to the motherboard via a number of pins. The socket connects to a bus which carries the signals from each CPU pin to the northbridge. The chipset (northbridge and southbridge) is generally designed by the CPU manufacturer (usually AMD or Intel) and allows the CPU to interact with the other devices on the motherboard. The northbridge is connected directly to the CPU bus, and the southbridge to the northbridge. High speed components of the system – the RAM and graphics card – connect to the northbridge, giving them an almost direct route to the CPU. Other components – SATA and PATA storage, USB ports, Ethernet, audio and CMOS – connect to the southbridge, which in turn connects to the northbridge and CPU. This is because these devices are less time-critical. The northbridge allows data from the RAM and graphics card to be prioritised and improves overall performance. The chipset is usually located to the left and below the CPU socket. As well as the north- and southbridge, the chipset contains any integrated network, graphics or audio units present on the board. 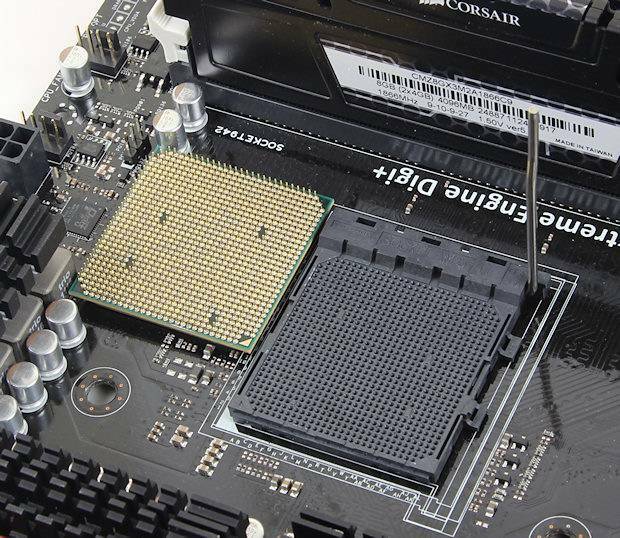 Often located to the right of the CPU socket are four slots for sticks of DIMM RAM to be inserted into. As the name DIMM suggests (dual in-line memory module) these slots are in fact two pairs. Some workstation and most server motherboards have more than four slots. Towards the bottom left one can find PCI and PCI Express expansion slots. These allow dedicated peripheral devices to be connected to the computer, such as graphics cards. They align with the expansion card mounts in the back of the case, which allow any cards to rest partially on the case and partially on the motherboard. On many motherboards, a small watch battery can be found. This powers the RTC, or real time clock, which keeps the time even when the system is switched off. If this battery is removed when the motherboard is not receiving power, the clock will need to be set in the BIOS next time the computer is started. Many of the devices that connect to the motherboard do so via headers. For example, the power and reset buttons on the front of many cases connect to a specific header in the lower half of the board. The most prominent of the other headers are for USB 2.0, USB 3.0 and SATA. The I/O panel on a Gigabyte GA-78LMT-USB3 motherboard. Usually pointing out the back of the computer, the I/O (input/output) panel provides ports to attach various peripherals. If the motherboard supports integrated video/graphics, there will be some from of display connector on the panel, be it VGA, HDMI, DVI, or all three. Similarly, if there is a sound and/or network chip on the motherboard, audio jack sockets and/or an Ethernet port will be available here. There are almost always USB ports available, and most motherboards have ports for PS/2 mice and keyboards. There are usually two power inputs on a modern motherboard. The first is the twenty-four pin power socket located in the upper right. This generally delivers enough power to run the CPU, motherboard components and most expansion cards (some high-end graphics cards require their own extra power). Some more demanding CPUs also require extra power, which is supplied to another eight pin connection in the upper left of the motherboard. 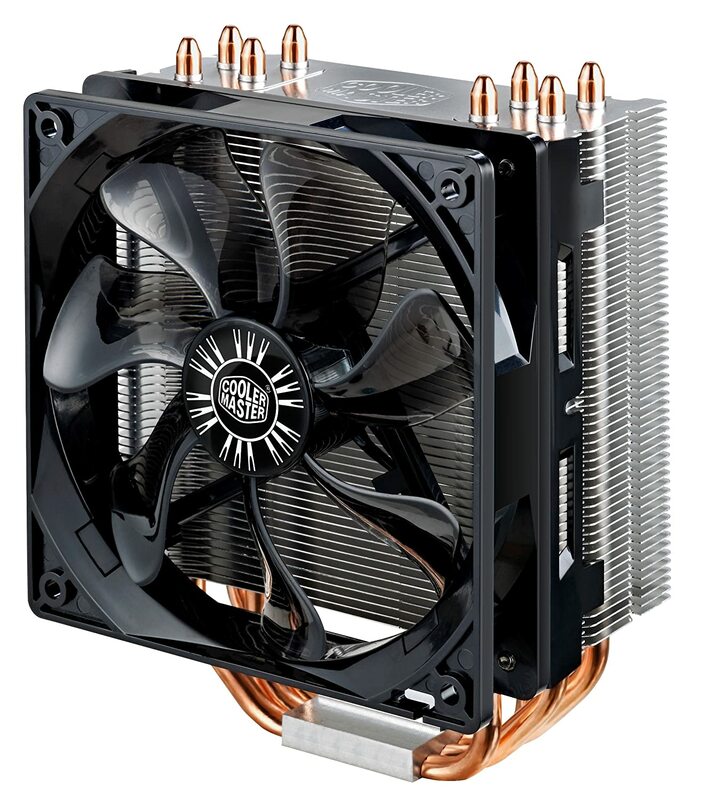 A Cooler Master 212 EVO air CPU cooler. As a CPU consumes a lot of power, and generates a lot of heat, a dedicated cooling solution is required. In most cases, this consists of a copper plate, connected to a series of copper heat pipes. Copper is used because of its high heat conductivity. The heat pipes pass up through an array of fins designed to have a high surface area. This combination is called a heatsink, and usually has a fan connected to the top to pull a supply of cool air through the fins. Also called thermal gel or compound, thermal paste allows better conduction of heat between the CPU and the copper plate. Without thermal paste to fill the grooves, the smallest imperfections in these two surfaces would cause a dramatic decrease in the efficiency of the cooler. Thermal paste is also used below the heatsink of a graphics card, particularly on high-end models. A Corsair H80i closed-loop liquid CPU cooler. Increasingly, people are deciding to use water cooling in their computers. Traditionally this was considered unnecessary and too dangerous to be beneficial. With the introduction of easier-to-use custom-loop components and pre-built closed-loop coolers, the popularity of water cooling has risen. It's now barely any harder to buy and install a closed-loop CPU cooler than a standard air-based cooler. Water cooling still uses thermal paste and a copper plate, but runs water over the plate inside sealed plumbing. A pump carries the heated water away from the CPU and into a radiator, often installed alongside a fan or two. Water cooling is a lot more effective than air cooling, and presents the opportunity to overclock. A Corsair RM650 650 Watt PSU (power supply unit). Components of a computer cannot run on mains electricity. They are designed to run at 5 and 12 Volts DC, not 230 Volts AC. This conversion is performed by a part of the computer called the power supply. Power supplies usually ship with a number of adapters for different purposes. For example, older components use Molex and floppy power connectors, whereas newer items tent to use SATA power. The majority of power is delivered to the computer components using ATX power connectors. The main two power sockets on the motherboard and any extra power sockets on the graphics card use this interface. There are also power connectors for fans, but these are generally found as headers on the motherboard. The case of computer holds all of the components, protecting them from dust and physical damage. The case also provides solid mounting points for these components and a convenient way for the user to start the computer. A Fractal Design Define R4 midi-tower case. In the centre left of most tower cases one finds the mounting points for the motherboard. These hold the motherboard to the motherboard plate, which is usually around 15mm from the back panel of the case. Towards the right side of the case one generally finds shelves for optical disc drives, HDDs, SSDs, card readers, fan controllers, and various other pieces of hardware. These racks can sometimes be removed from the case in order to free space and improve airflow. Around the case, particularly in the back somewhere, fan mounting spaces can be found. These usually can accommodate 80mm, 120mm or 140mm fans to ventilate the inside of the case. Some models of case also include dust filters to cover these areas and prevent as much dust from entering the system as possible. The system's power supply is typically mounted in the bottom left of the case, and is allowed to draw air in from behind the case and let it flow up. Some other cases also let the user mount the power supply the other way up, meaning the air leaves the case through another vent on the bottom. Many cases provide space for cable management, usually between the back panel of the case and the plate that the motherboard is mounted on. This allows cabling to be routed neatly improving the aesthetics of the system and the airflow through it. A number of different pieces of software are required in order to run a desktop environment. The first to load is stored on the motherboard's CMOS, and is the BIOS (Basic Input/Output System). The second is the bootloader, which passes control of the computer to the operating system. Although currently in the process of being replaced by UEFI (Unified Extensible Firmware Interface), BIOS is the first program to load on most computers. BIOS checks that all of the essential (basic) components are available to the system, and is able to warn the user in a number of ways if it isn't. For example, bleeping can often be heard if RAM cannot be accessed or is not present on the motherboard. The bootloader is a small application installed on the first few sectors of a storage device available to the computer. The BIOS dictates which drive the computer should attempt to boot from, and this will likely be successful if a bootloader is installed. The bootloader can be used to select which installed operating system to boot from if a dual-boot configuration is present, and will load initialisation images from the selected OS's partition. The operating system – be it Windows, Linux, BSD, OSX or something else – then continues the boot process by loading a kernel and the first processes and services.